Okay, I’ll admit it – the “Form Storm Norm Perform Adjourn” (FSNPA) group formation stage theory doesn’t work for me. As a teacher I find myself always amending and reinventing it. Bruce Tuckman developed the FSNPA stage theory in the 1960s as part of his post-PhD work as a research psychologist at the Naval Medical Research Institute. Tasked with drawing on research and observation to map out a framework that would cue effective group functioning practices among Navy crew members preparing for small crew vessels and stations, Tuckman proposed the first iteration of his framework: Form Storm Norm Perform. Tuckman Group Formation Diagram from The Happy Manager. These are attractive labels for setting out progressive stages a group would likely (need to) move through to complete an assigned task. As Hart and Trombley note, “longevity [in use of this model] reflects Tuckman’s ability to categorise and synthesise – and to get it right” in setting out an overall arc of development to describe the contours of a high-functioning group. Resources at the end of this post provide clear, useful reviews of FSNPA stages and overall development arc. Because I edit this blog, I set a goal to write a post putting to words an alternative framework I have devised for engaging students as collaborators in team-based,networking- and learning-circle informed, complex-learning, authentic-audience assignments. This post, then, is my first pass at sharing ideas I weave together from working with scored of undergraduate learners and doctoral future faculty students a DIT endeavor. Do it Together. That certainly is at the heart of what I propose here. Conform, so we get along! Conform, so we can say we adopted ground rules to manage conflict! Conform, so that we can pitch a middle-of-the road, 2-sides argument thesis! Members of the group looked very much alike, so assumed we were an “un-diverse” group. Because our primarily white educational context from kindergarten through college implicitly taught us that the marker of diversity within a group was visible race or ethnicity, the default position left us unaware of diversity – its subtleties and multiple dimensions: ability, age, class, gender, nationality, race, religion, sexual orientation and other personal, social and cultural identities and affinities. In that context group think did creep in, allowing the act of forming a unified front to carry out the assigned task without engaged consideration of alternative perspectives; those perspectives/ideas – and those advocating divergent ideas and addressing of diverse experiences – could be treated as some sort of a threat to group cohesion and task completion. By acting in unison to defend the group, those not of the group and those not joining in the group face the dangers of getting lost, facing malevolence, and/or being seen as a predatory – all of which leads to closing of ranks, to group think, and to other constraints on autonomy. During graduate school, my mentors engaged practices that prompted productive, culturally savvy, constructivist- and transformative-oriented learning groups. As a teacher I began building on that experience. Still, I needed some help in describing processes of ambiguous thinking required in addressing novel problems and of non-linear task-related progression over time. For example, where the FSNPA stage development maps out a trajectory of “continuous incremental changes,” I saw, instead, group learning processes characterized by “rapid and dramatic evolutionary changes” (Hart and Trombley) during which long periods of individual networking and task-related learning work interlaced with occasional bursts of big change when team members came together based on timing and task cues they had mapped into a (hopefully dynamic and multi-faceted) Action Plan. My observations, additionally, confirmed that students saw “groups” and “teams” as interchangeable terms, equivalences for naming any occasion when people worked somehow “together” to accomplish a specifically framed task. Groups, like coalitions, are informal configurations that run for a very short-term as a collection of individuals pursue specified ends, as specific task or exercise, which may contribute to a larger discussion or cause. * recognise audiences in communities beyond the classroom. What’s Missing? What’s an Alternative? As a linear, stage-driven process FSNPA seems, more often than not, to set up closed groups as a default, where students engage in acquisition-based learning; in this, a group moves from understandings rooted in Dualism/Received Knowledge to more nuanced Multiplicity/Subjective Knowledge. The ideas are further shared with – acquired by – other learners via some means of presenting a final project artifact. And that can be good. As a starting place, this alternative presupposes that all components of a team-based learning framework are overlapping – that is, they happen simultaneously, are interconnected or interdependent, with components of the process requiring multiple or iterative engagement. In recognizing this, team members may be supported when working independently, in various networks, in tandem configurations, and as a collaborative, collective team. Rather than linear, the interactions in this framework suggest a open network that positions feedback-rich and conflict-aware pauses at several nodes within the framework (making use, then, of formative assessment and team-selected interpersonal communication protocols). Additionally, it offers – as does the revised, full-spectrum Bloom’s Taxonomy – ways of addressing cognitive, affective and psychomotor dimensions of learning. Verbs, lots of verbs, are embedded in this framing to assist teaching and learning participants in negotiating their current work and navigating next steps in an emergent action plan. Team Formation Diagram revised and devised by @IleneDawn. The diagram and narrative that follow it are available at z.umn.edu/CCCPFtask. I see – and experience – team-based learning work within this circling, formative, collaboratively interdependent network. What follows are the passages I’ll propose in explaining this first written iteration. At the center, this marks that place where individuals, working-groups, visiting networkers and team members will need to come back to some center (shifting as it might become) to do the work of negotiating, making, weighing, proposing, synthesizing as they meaning (cognitive, affective, psychomotor) related to the task, write large and small, at hand. The circle framing aims to indicate that learning related to team-based tasks is meant to be transformative rather than instrumental in orientation. In selecting the circle, I mean also to signal to learners the equivalent importances of learning outcomes and purposes with practices of discovery, synthesis, creation, evaluation, and networking in shared learning endeavors that will require agility – even in manipulation of the task itself to grow an idea. Common Denotative Definition: relational process through which people bring ideas together or into contact so that real or notional links are established; commonly, high levels of relaxation and socialisation are characterise connecting interludes across work on a team-based task. Synonymous Verbs/Actions: attach, join, fasten, fix, affix, couple, link, secure, hitch, stick, adhere, fuse, pin, screw, bolt, clamp, clip, hook up, add, append. Disruptive Verbs/Actions: disengage, divide, rupture. how individuals bring personal preferences, learning characteristics, values, and topic-related attitudes to learning. Furthering topic-based learning, whether their own or an intended audience, by seeking, collecting, synthesising, and sharing broad ranges of, types of, and sources of information. Common Connotative Definition: to bring different elements of a complex activity or organization into relationship with aim to ensure efficiency or harmony. Synonymous Verbs/Actions: collaborate, liaise, negotiate, organize, arrange, order, communicate, be in contact, complement, set off/harmonise, systematise, harmonise, correlate, synchronise, bring together, fit together, dovetail, indicating position of a point/line, form a coordinate bond, equal in rank or importance or function. Disruptive Verbs/Actions: confuse, disorganize, skew, alienate. Common Denotative Definition: to bring an original idea that has value into existence; playing with ideas, creativity, imagination, and thinking differently; “working in a highly focused way on ideas and projects, crafting them into their best forms, and making critical judgments along the way about which works best and why” (Ken Robinson). Synonymous Verbs/Actions: generate, bring into being, make, fabricate, fashion, build, construct; design, devise, originate, frame, develop, shape, form, forge, establish, found, initiate, institute, constitute, inaugurate, launch, set up, form, organise, develop, bring about, give rise to, lead to, result in, cause, produce, make for, promote, foster. Disruptive Verbs/Actions: destroy, undermine, hold out, sow the seeds of discontent. Dropping unsuccessful lines of research and patterns of behaviours in order to support new work and perspectives. Common Denotative Definition: (1) marking a person being in a particular place, an idea existing/occurring now; (2) offer, call attention to, bring about or show an idea/thing created for others to scrutinise or consider, often through an exhibit, a product, or another means of formal delivery ; (3) something given as a gift. Synonymous Verbs/Actions: (1) in attendance, here, nearby, (available, in existence, existing, existent, current, present-day; (2) hand over/out, give out, confer, accord, give, set forth, put forward, offer, introduce, make known, acquaint someone with, express, demonstrate, show, display, launch, unveil, represent, describe, portray, depict; (3) donation, contribution, offering. Presenting is more than a performance of an idea developed/task completed via a process of working well together. Presenting, rather, maintains a three-point focus on audiences for a given project task, on clarifying within the team emergent understandings of core ideas, and on composition of artifacts that will suitably convey core ideas to main audiences. Presenting includes drafting and development of artifacts in an open networked environment. Common Denotative Definition: to bring a task or activity to completion, to a conclusion, to a polish off – as in giving something an attractive surface appearance, to wrap up. Synonymous Verbs/Actions: complete, end, conclude, stop, cease, terminate, bring to a conclusion/end/close, wind up, crown, cap, round off, put the finishing touches to; accomplish, carry out, get done, fulfill, complete, conclude, over and done with, at an end, accomplished, sewn up, polished up. Disruptive Verbs/Actions: to settle, to leave incomplete, to end abruptly, to disband. 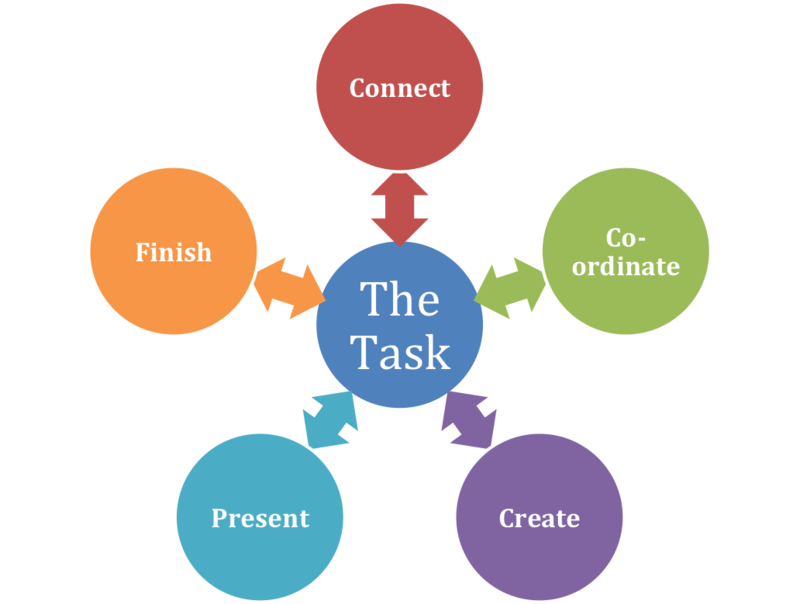 Finishing combines culminating activities in both assessment of team work and team project, and sharing of an open educational resource for audiences including in and beyond the team, the teacher, the classroom. Further, in finishing, team members and their network will work to dissolve the current project as a task-related set of interactions, while also addressing ways of drawing on this learning experience, this team, this network in future learning and networking. Mark Smith. 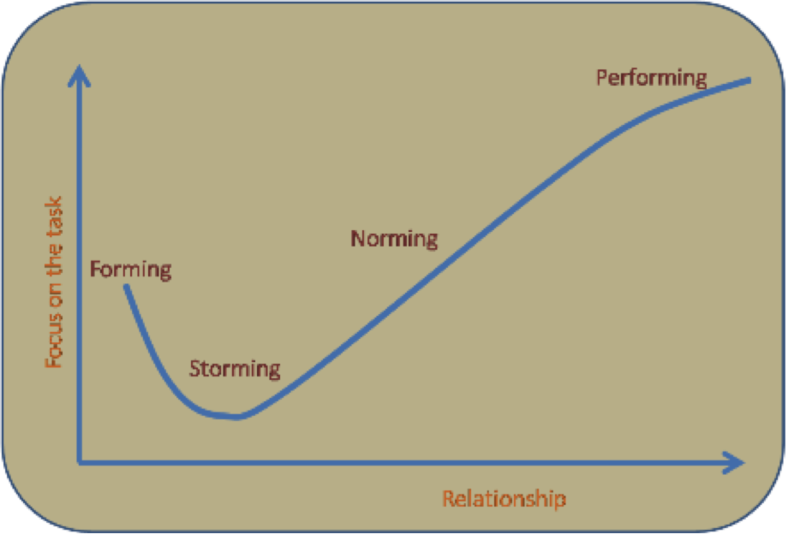 “Bruce W. Tuckman – Forming, Storming Norming and Performing in Groups.” http://infed.org/mobi/bruce-w-tuckman-forming-storming-norming-and-performing-in-groups/. Andrew C. Hart and Sarah M. Trombley. “The Punctuated-Tuckman: Towards a New Group Development Model.” Paper presented at the International Research Conference in The Americas of the Academy of Human Resource Development, 2007. http://eric.ed.gov/?id=ED504567. Jenny Mackness. “The Hazards of Groups and Group Work.” Jenny Connect (blog). http://jennymackness.wordpress.com/2014/04/28/the-hazards-of-groups-and-group-work/. Papusa Molina. “Recognising, Accepting and Celebrating Our Differences.” In Making Face, Making Soul. Gloria Anzaldua, ed. San Francisco: Aunt Lute Press, 1990: 326-331. Team Formation Diagram revised and devised by @IleneDawn. The diagram and narrative that follow it are available at http://z.umn.edu/CCCPFtask.